• Half your ironing time - reduce your carbon footprint - save electricity. • Non-slip heat resistant material. • Prevents burn marks on clothes and ironing board covers. • 10mm Thick cushioned ironing surface. • No ugly mesh marks. • Protects buttons, embroidery, sequins and zips. • Perfect for ironing seams, pleats, quilting, and collars. • Ideal for delicates like silk or chiffon. • Fully reversible and washable for maximum durability. • To activate the steam-press function, spray the foam with water and iron as normal. 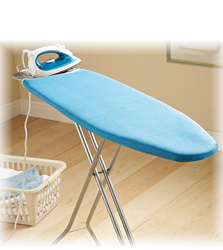 Turns your Ironing Board into a Steampress! Designed & Manufactured in South Africa with quality in mind!